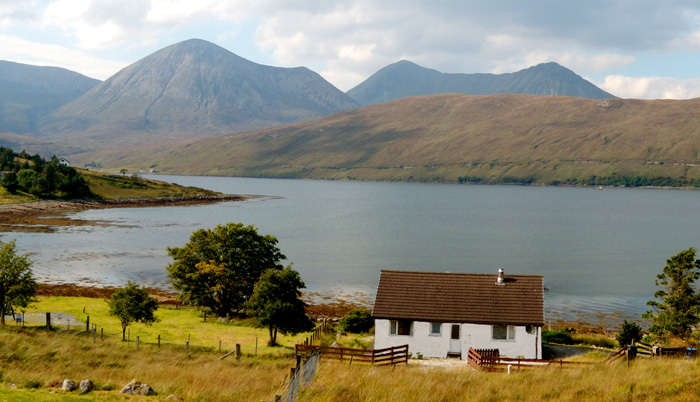 Otters Leap Holiday Cottage, Skye: Travel and How to Find Us. There are three routes on to the Isle of Skye. The first and most popular route brings you across the Skye Bridge from Kyle of Lochalsh on the mainland. The driving time to Otters Leap from the bridge is less than 30 minutes. The bridge is open 24 hours a day, 7 days a week, and is toll-free. The second route involves a ferry journey from Mallaig on the mainland to Armadale on Skye, from which you have a drive of about 50 minutes to reach Otters Leap. Please note that this is not a 24-hour service and a reduced timetable operates in the winter. You can check timetables online at Caledonian MacBrayne. The third route - available during the main tourist season only - makes use of a small turntable ferry which operates between Glenelg on the mainland and Kylerhea on Skye. See skyeferry.co.uk. The journey time from Kylerhea to Otters Leap is about 45 minutes. Our nearest airport is at Inverness. This has flights operated by easyJet (from London Luton, London Gatwick, Bristol); Flybe (from Belfast, Birmingham, Jersey, London Gatwick, Manchester, Southampton); Lufthansa (from Dusseldorf) and Falcon Travel (from Zurich). Car hire at Inverness Airport is available from Avis and Europcar. The journey time from Inverness to Skye is about 2 hours. 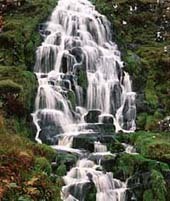 Scotland's biggest airport is Glasgow, which is about 5 hours' drive from Otters Leap. Our nearest train station is at Kyle of Lochalsh, on the mainland close to the Skye Bridge. Trains operate to Kyle of Lochalsh from Inverness. Car hire is available at Skye Car Hire in Kyle of Lochalsh. It is also possible to travel by train from Fort William to Mallaig and complete your journey to Skye by ferry to Armadale. Train timetables are available from Trainline. Although we would recommend that you have access to a car whilst staying at Otters Leap, it is possible to reach us by bus. CityLink operate buses from Inverness and Glasgow, and will drop you off at Luib. Local buses on Skye are operated by Stagecoach Bus. Full details for finding Otters Leap once on Skye will be provided after you have paid your balance.